By Miles Ogihara / Nov. 28, 2018, 7:21 a.m. The Israeli government should worry. It faces a threat that doesn’t come in the form of terrorism or economic sanctions. Rather, its number one ally, the United States of America, is dealing with a debilitating struggle over its support of Israel. According to the latest Pew Research poll, Americans are more divided on the Israeli-Palestinian conflict at present than at any other point since 1978. If a solution is truly attainable, the current political climate in America is making it further out of reach. American discord is a clear impediment to the prospect of stability.Without a general consensus among the American public, the United States government will continue to obstruct a fair, viable, and agreeable peace plan from being enacted between Israel and Palestine. The Israeli-Palestinian conflict has always been a rigid dichotomy. In one camp are supporters of the Israeli presence in the West Bank under the justification of security and Jewish sovereignty. On the other side are advocates for Palestinian autonomous statehood within the West Bank and a Right of Return. Even so, the special relationship between the American and Israeli governments has historically been bipartisan. In the past, Democrats and Republicans have been able to join together repeatedly to pass generous resolutions and bills promoting military cooperation, trade partnerships, and economic aid since Israel’s founding in 1948. However, bipartisan support for Israel has vanished. What has changed? The answer lies in the changing American and Israeli political dynamics. The widening gap in political party ideology and demographics in the United States has caused a dramatic shift in support for Palestinians and Israel. This rift can be attributed to four main factors: Israeli Prime Minister Benjamin Netanyahu’s current right-wing administration, Donald Trump’s presidency, the leftward movement of the American Democratic Party in response to a younger, more diverse voter base, and the increased role of religion in the Republican Party platform. Israeli Prime Minister Benjamin Netanyahu’s current government has been Israel’s most conservative coalition. His majority party, Likud, has relied on the support of various popular far right-wing parties, which are dominated by some of the most religious and nationalist political figures in Israel. In return for pledged support, Netanyahu has given many cabinet seats to the leaders of rightists parties such as the religious-nationalist Jewish Home and the extremely orthodox United Torah Judaism. This has given unprecedented amounts of political influence to the ultraconservative factions of Israel. As a result of this right-wing coalition, Israel has been able to maintain policies that ban commercial activity on the Sabbath, show support for settlements in military occupied the West Bank, deny egalitarian prayer sites at the Western Wall, and forbid intermarriage between Jews and non-Jews—all policies which stem from orthodox Jewish practices. Moreover, in recent months, Netanyahu’s Likud party has stepped up its rhetoric against the Islamic movement in Jaffa and the influx of Eritrean refugees, promulgating Israeli propaganda and slogans such as “The Hebrew city” and “It’s us or them.” And with the Nakba protests in recent months resulting in the death of numerous Palestinians—both Hamas members and civilians—liberal Americans are increasingly outraged with the Israeli government and military. Consequently, Netanyahu and his government have done little to promote a more secular and socially progressive Israel, thus alienating American liberals. Netanyahu’s government has resulted in a sharper divide between Americans over Israel. According to a 2018 Gallup poll, only 17 percent of Democrats had a favorable view towards Netanyahu in comparison to 64 percent of Republicans. The Prime Minister of Israel’s platform has contradicted liberal values, such as the separation of church and state, inclusion of minority groups, gender and religious equality, and the right to Palestinian sovereignty in the West Bank. Given this sharp divide in values, Democrats have a strong animosity towards Israel’s leader, making it extremely difficult to support Israel while he remains in control. Benjamin Netanyahu’s government fails to live up to Democratic demands of social justice, causing the party to be dissatisfied with the state of affairs in Israel and accordingly extend more sympathy to the Palestinian cause. Until Israel elects a new prime minister or Netanyahu reconsiders his quid pro quo relationship with the far-right, Democrats will continue to distance themselves from the current Israeli government. President Donald Trump, in contrast to President Barack Obama, has initiated vastly different policies towards Israel. First, Obama was an avid supporter of the Joint Comprehensive Plan of Action (JCPOA) which lifted sanctions on Iran in exchange for promising to halt its nuclear development program for fifteen years. Iran’s compliance would be—and has been—verified by the International Atomic Energy Agency (IAEA). The Israeli government adamantly opposed the deal due to fears that the loosening the stranglehold on the Iranian economy would strengthen the regime. In contrast, Trump has withdrawn America from JCPOA, which has been celebrated by the Israeli government. Obama also allowed various United Nations sanctions to be passed, punishing Israel for its continued military occupation of the West Bank, and funded organizations such as the United Nations Relief and Works Agency for Palestinian Refugees. The Trump administration has fought against similar UN resolutions critical of Israeli military policy and has pulled funding from various UN organizations it deems to be anti-Israel. Obama also refused to move the US embassy to Jerusalem or acknowledge the city as Israel’s capital. In contrast, Trump has moved the US embassy to Jerusalem, recognizing the Holy City as Israel’s capital—an unprecedented move by an American president. For Democrats, Obama’s foreign policy seemed to promote an end to the conflict. By the end of the Obama’s second term, a strong majority of Democrats approved of his international approach, while an overwhelming amount of Republicans disapproved. On the other hand, as of 2018, a vast majority of Republicans approve of Trump’s foreign policy while nearly all Democrats rate it unfavorably. While these numbers are not specific to the Arab-Israeli conflict, they demonstrate America’s current political mentality: Democrats value multilateralism while Republicans favor its antithesis. Thus, while international policy used to be dominated by an area of bipartisan overlap, it now serves as a divisive mechanism. In terms of foreign policy, American political parties have been radically polarized, and Republicans have zealously supported Trump’s policies, which clearly favor Israel. Trump’s stance on Israel has allowed him to grow close to Benjamin Netanyahu, which stands in direct contrast to Obama’s tense relationship with the Israeli Prime Minister. 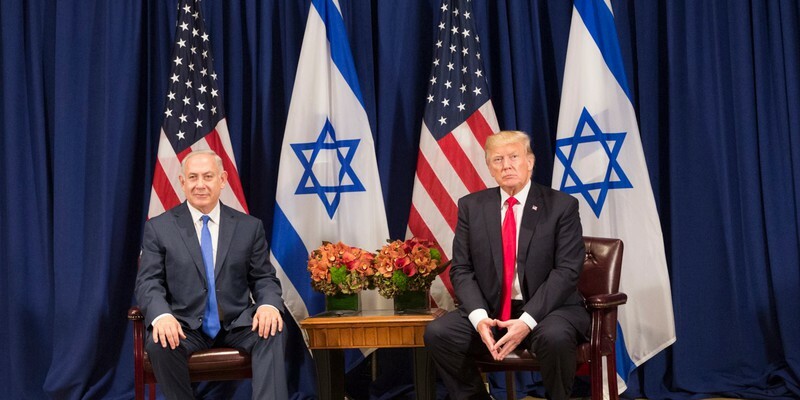 With these strong diplomatic ties between the two leaders, Trump and the Republicans are now seen as the “pro-Israel” party, leaving Democrats marginalized. As the two leaders pursue their common interests, the Democratic party is losing its positive political connection with Israel. Democrats now find their agenda sidelined by the conservative-policy driven relationships between the administrations in Israel and the United States. As a result, the left has found its base in the midst of a rebellion against American and Israeli right-wing prominence and has increased its compassion for Palestinians. Thus, these oppositional movements have pressured individual Democrats and Republicans to accept the standards set by their party and divide themselves over the Israeli-Palestinian conflict like never before. The Democratic Party is going through a powerful demographic shift. The vast majority of minority and non-religious voters align with the Democratic party as of 2018. Moreover, according to the polling firm Global Strategy Group and the Jerusalem Post, fewer than half of African Americans and Latinos in 2016 believed “Israel shares my values.” The same poll also shows a sharp decline in Jewish college students—and millennials as a whole—leaning toward the pro-Israeli side of the conflict. Democrats have recognized and adjusted their policies to this demographic and ideological shift. In the midterm elections, there were numerous candidates with platforms that supported Palestinian statehood and criticized the Israeli presence in the West Bank. For example, Ilhan Omar, a Somali-American Muslim recently elected represent Minnesota’s 5th congressional district, tweeted about Israel’s “evil doings” and called attention to the “apartheid Israel regime.” Eight-term Democratic congresswoman Betty McCollum has introduced legislation that would end American tax dollars going to Israeli military support due to human rights concerns of Palestinian children. And Keith Ellison, a controversial progressive critic of Israeli presence in the West Bank, is the Deputy Chair of the Democratic National Committee. This shift in dynamics has been coupled with the rising prominence of many outlets for progressive voters to share their grievances over the Palestinian-Israeli conflict. Organizations such as JStreet and Students for Justice for Palestine have gained prominence in recent years, fighting back as alternative ideological pathways to the powerful mainstream pro-Israel lobbying organization, the American Israel Public Affairs Committee (AIPAC) and the current state of American-Israeli political affairs. In turn, Democrats have become increasingly pressured to adapt their positions on Israel. They are becoming more sympathetic to Palestinians in order to match their younger, secular, and more diverse base’s progressive viewpoints. In stark contrast to Democrats, the Republican Party ideology is becoming more religious. Most importantly, the majority of Orthodox Jews voted for Trump alongside a motivated evangelical community. Republican politicians face enormous pressure to please their religious base in order to maintain their electoral success. And, for many in the GOP’s support base, Israel is of the utmost importance. As the birthplace of Jesus and the historical homeland of the Jewish people, many American religious communities feel a spiritual, cultural, and theological bond to the land. It is the Holy Land for Judeo-Christian religions, and the Christian supporters of the GOP believe it best maintained by an Israeli governing body rather than an Arab one. Therefore, for religious conservatives, supporting Israel in its current state is a necessity. With evangelicals becoming an even more integral piece of the Republican base, the party has adopted more right-wing positions regarding Israel to keep up with the religious zeal in red districts. In turn, many powerful religious lobbying organizations serve as an outlet for voter agendas. For example, the largest (by membership) pro-Israel lobbying organization in the United States is the evangelical Christians United for Israel (CUI). With nearly 4.1 million members, most of whom identify as devout Christians, CUI represents a politically advantageous organization for Republicans to align with in every election cycle. If a Republican politician fails to meet the demands of their party’s religious base—which often parallels the CUI agenda with respect to Israel—their reelection campaign will most likely suffer. Now, Republicans find themselves increasingly at odds with Democrats over this issue. While the evolving secular Democratic party sees the conflict as a matter of universal human rights and social injustice, the Republicans frame the issue as a matter of maintaining voters’ theological integrity and Judeo-Christian beliefs. The partisan divide over Israel is subsequently taking a new, increasingly popular form: revealing itself as an ideological schism between secularism on the left and religion on the right. The increasing divide between political parties on the issue will not be good for America, nor for its previously-held role as a mediator in the conflict. It benefits neither Israel nor Palestine for the conflict to be divided along party lines. Partisanship will only make compromise more unlikely. Any one-sided political proposal will struggle to remain viable when an opposing party takes control in Israel, America, or within the West Bank. A sustainable, effective, and multilateral solution will only become a reality once common ground is found and political unity is revived. To transform the prospect of peace into a reality, Americans need to get out of their partisan bubbles. They need to read news ranging from Al-Jazeera to the Jerusalem Post to feel uncomfortable, engage in dialogue with those of differing viewpoints to understand why others disagree, and truly internalize the conflict between Israel and Palestinians, rather than following what a party “base” tells them to believe. Democrats and Republicans need to reevaluate their relationships with one another and rekindle the bipartisan nature that filled the halls of Congress in the past. Our political parties must find the willpower to sit down, be reasonable, and put real effort into finding common ground on foreign policy. If America can rise to the occasion, then perhaps there is hope for a future where hatred and division are replaced with coexistence and harmony between Israelis and Palestinians. Miles Ogihara is a Contributing Writer for the Gate. Opinions in this article are not reflective of those of the Gate. The image featured in this article is in the public domain, as it is a work of the US Federal Government (the White House). The original image can be found here.